Silly me. All these years I have been trying to keep dandelions out of my yard. In Ohio's Amish country they are baking them, making wine from them and, in fact, celebrating them with a very special festival. BreitenbachWine Cellars, 5934 Old Route 39 NW, Dover, Ohio, (330) 343-3603, will hold its annual Dandelion Festival Friday April 30 from noon-7:00 PM and Saturday May 1 from 9:00 AM to 7:00 PM. This festival provides fun and many activities for the entire family. Dandelion wine sampling, cellar tours and live entertainment are scheduled for both days. On May 1 at noon, children can enjoy the dandelion picking contest and making their own dandelion jelly. (Meet in front of the purple barn. This year you will be able to make your own dandelion pizzas. Dandelion sausage, dandelion bread, dandelion gravy, dandelion lasagna, dandelion ice cream and dandelion sangria will be available both Friday and Saturday. will be a major part of the festivities. Creative dandelion dishes provide tasty samplings while participants compete for cash awards. For those who big appetites for dandelion's, the Great Dandelion Cookbook is available through the winery. Dandelions are great in food, they are fun to pick and they can beautify your life. A juried dandelion arts and craft show will feature beautiful handmade jewelry, oil and watercolor paintings, candles, hand-made soaps (including dandelion soap), books about dandelions and much more. 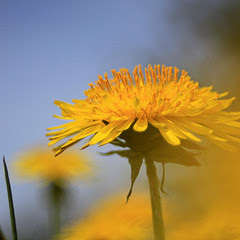 Also, you can learn about cooking with dandelions and the healthful benefits of dandelions. Greg Chek will be preparing Dandelion Pizza at 10:30 in the purple barn. Ruth Hale from "April Showers Greenhouse" will lecture on the healthful benefits at 11:30. At 12:30 Cheryl Cohen from Taste of Home Cooking School will have cooking demonstartions. She will be preparing "Dandelion Crescent Pie" and "Blueberry Medley Salad with Dandelion Greens". All of the food in the demonstrations will be available for sampling. In the Dandelion May Run, runners compete for cash prizes. The course is 3.5 miles through beautiful, hilly Amish Country. Registration for the run begins at 7:30 AM on May 1. Be sure to stay afterward and enjoy the festival. Entertainment is scheduled from noon to 7:00 PM on Friday and from 11 AM to 7 PM on Saturday.